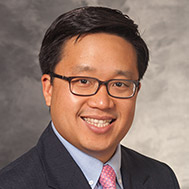 John-Paul Yu, MD, PhD, is an Assistant Professor, in Radiology (Neuroradiology), Psychiatry, and Biomedical Engineering. His research focuses on developing a comprehensive and multidisciplinary approach towards the neuroimaging of schizophrenia and neuropsychiatric disease. Yu’s KL2 mentors are Elizabeth Meyerand, PhD, (School of Medicine & Public Health, College of Engineering ) & Vaishali Bakshi, PhD (School of Medicine & Public Health).